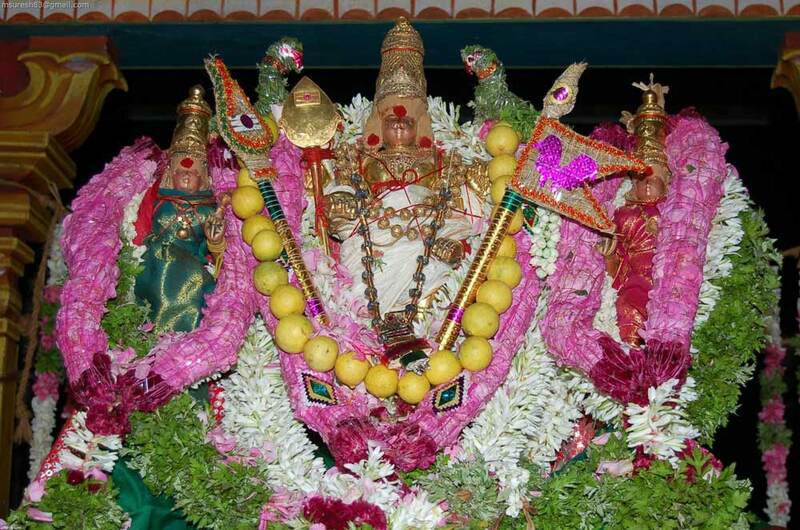 In most Murugan temples, Kanda Ṣaṣṭi festival is celebrated for six days only. In some temples it is celebrated for seven days, with the divine wedding of Lord Murugan the day after Ṣaṣṭi. But in Tiruchendur the festival is held for twelve days; the first six days of Kanda Ṣaṣṭi comprise Ṣaṣṭi vratam (the vow of Ṣaṣṭi) and Sūra Samhāram (the annihilation of the demon, Sūra), on the seventh day it is the divine wedding of Lord Murugan and Teyvānai, and in the next five days, the Lord in His wedding gear appears and blesses in the Unjal Sevai that is, sitting on the swing. At Tiruchendur, every day nine times poojas are performed for Lord Murugan. During these poojas different naivedyams (food offerings) like dhal pongal, kanji (gruel), thosai, appam, ghee-rice, balls made of cooked green gram and jaggery are offered. Though there are many temples for Lord Murugan in Tamilnadu, six temples are specially worshipped as patai veetu (armory house). Where the Commander-in-Chief who goes for battle stays with his army is called his patai veetu. Accordingly, Tiruchendur is the only place where Lord Murugan with His army stayed, when He went to destroy Sūrapadman. But we also call Ārupatai Veetu the other five temples along with Tiruchendur. Lord Murugan won and accepted Sūrapadman on Ṣaṣṭi (sixth day) of the waxing moon (bright) night (valar pirai) of the month Aippasi. This day is celebrated as Kanda Ṣaṣṭi. This incident happened at Tiruchendur and hence, the Kanda Ṣaṣṭi festival is calebrated in this place with all grandeur. In the Kanda Purana of Mahābhārata, two other causes are indicated for the celebration of Kanda Ṣaṣṭi festival, apart from the extermination of Sūrapadman. Once a few sages conducted a yāga (sacred fire worship) with a behest to get a son for the welfare of the world. It was begun on the New Moon day and went on for six days. From the fire erupted out of the sacrificial altar (yāga kundam), six seeds – one seed each day for six days respectively – were collected. Lord Murugan was born on the sixth day, when all these six seeds were made as one. The Mahābhārata asserts that the day of the birth of Lord Murugan is the Kanda Ṣaṣṭi Day. In the Kanda Purana, Kachiappa Sivāchāriyar says that the Devas, in order to become powerful to challenge the asuras, carried on a vow by soliciting Lord Murugan to be in the kumbham (sacred pot) for six days. Lord Murugan blessed them likewise. This incident is remembered as Kanda Ṣaṣṭi and celebrated after Aippasi New Moon day – so says Sivāchāriyar. At Tiruchendur, on the first day of the Kanda Ṣaṣṭi festival during early morning, comes Jayantināthar (Lord Murugan) with His spouses Valli and Teyvānai, representing the primary deity. The yāga commences in the hexagon shaped sacrificial fire altar (yāga kundam) for the victory of Lord Murugan. Around the altar, Lord Siva, Goddess Sakti, the Four Vedas, Lord Murugan, Valli, Teyvānai, Maha Vishnu, Vināyaka, the Seven Gurus, Vāstu Brahma, the Devas, the Sun, the Ashtadik Bālakas (the guards of the eight sides), the Dwara Bālakas (the Entrance Securuties) - all these devatas are made to rest in the kumbhams. The yāga is conducted till noon and after the pooja Jayantināthar goes to the Shanmugavilāsa Mandapam. On the sixth day, the Lord without His spouses, comes to the seashore and kills Sūran. After this, the Victorious Lord with Valli and Teyvānai returns to the yāga sālai. Jayantināthar then comes to the sanctum of Mahādevar at the paved corridor. At that time, a mirror will be placed before Him. The priest will conduct the abhishekam to the image of Jayantināthar reflected in the mirror. 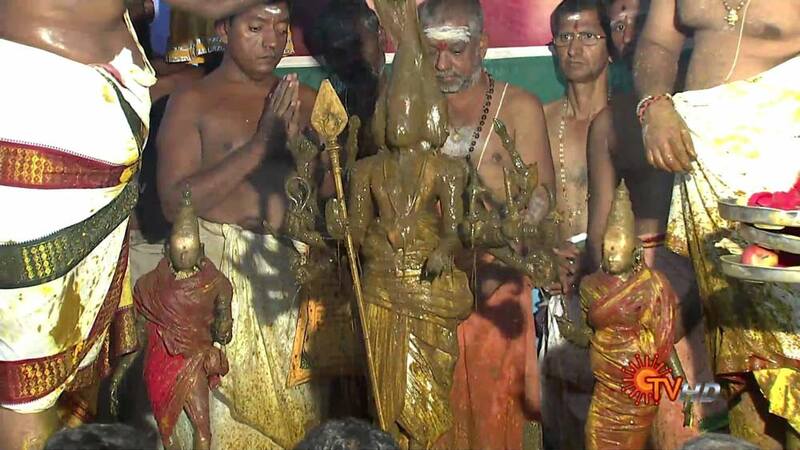 This is called chāyabhishekam (chāya means shadow). This abhishekam is performed to cool down the victorious Lord Murugan. The tradition is that Lord Murugan Himself enjoys seeing this Mirror Abhishekam. The Lord returns to His sanctum and with this, the event of Sūrasamharam (the annihilation of Sūra) comes to an end. On the next day that is on the seventh day, the holy wedding of Lord Murugan and Teyvānai is performed.  Lord Indra not only gives Teyvānai in marriage to Lord Murugan for having defeated the asura but also renders service by becoming the holy peacock. This marriage happens at Tirupparankundram, the first Patai Veetu. At Tiruchendur, the holy wedding between Lord Murugan and Teyvānai is performed on the next day to Kanda Ṣaṣṭi since it is the place where Sūrapadman is vanquished. During the morning of that day, Teyvānai goes to the Tapasu Mandapam and will do her tapasya to get married to Lord Murugan. In the evening Kumāra Vitankar (another Utsava murthi), representing Lord Murugan goes to the Tapasu Mandapam seated on His peacock vehicle, garlands Teyvānai and gets engaged. Towards midnight, both reach the Tirukalyāna Mandapam. There the wedding is performed. The next day, the Lord with Teyvānai goes in street procession. The next three days the Lord in the Tirukalyāna Mandapam will be on the oonjal (swing) and bless the devotees. During the festivals in the villages, maidens enjoy pouring turmeric water on boys on whom they have a customary claim for marriage. In a similar way, in this place also the turmeric bath is conducted to Lord Murugan. On the last day of Kanda Ṣaṣṭi festival, Lord Murugan with His spouse Teyvānai goes in street procession. At that time, the devotees receive the Lord who has had His wedding in their village and to contain the rage happened due to the battle with Sūran, joyfully pour turmeric water on the Lord. Lord Murugan is an incarnation of Lord Siva. He as a Guru to His father taught the meaning of the pranava mantra OM. He imprisoned Lord Brahma since Brahma did not know the meaning of the same mantra. After extinguishing Sūran, He married Lord Vishnu’s daughter. He was bound by the affection of His uncle, Lord Vishnu. Thus, Lord Murugan is related to all the three Lords, Trimurthis. To indicate this, Lord Murugan at Tiruchendur appears as an incarnation of Trimurthis, Lord Siva, Lord Vishnu and Lord Brahma during the festivals conducted in the months of Āvani and Māsi. On the evening of the seventh day of the festival, He is adorned with red dress and appears as Lord Siva. At the dawn of the 8th day, He is dressed in white and graces us in the form of Lord Brahma and during the noon He appears in green dress signifying Lord Vishnu. At Tiruchendur, the Rajagopuram is on the western side of Lord Murugan’s sanctum. Here, Lord Murugan faces east looking at the sea. The Rajagopuram should be opposite to the Lord in the east; since the sea is there in the east, the Rajagopuram is erected in the west. As the threshold of this gopuram is higher than the rostrum (peetam) of the prime sanctum of Lord Murugan, it remains always shut. During the Kanda Ṣaṣṭi festival in the midnight of the Divine Wedding day, this door will be opened. At that time, however, the devotees will not be allowed to enter through that door. Generally, there will be only one Utsava Murthi for the primary deity of any temple. But in Tiruchendur there are four Utsava Murthis: Shanmukhar, Jayantināthar, Kumāra Vidangar and Alaivāy Perumal. The specialty is that all these four have separate sanctum each. Kumāra Vidangar is called Māppillai Swami meaning the Bridegroom Lord. Of the six patai veetu of Lord Murugan, it appears as though Tiruchendur alone is located in the seashore and the other five are hill-temples. In reality, Tiruchendur is also a hill-temple. This temple is situated in the Sandal Hill at the seashore. Hence, this sacred place is called Gandhamādhana Parvatam. In course of time this hillock has disappeared. Even now, near the sanctum of Perumal in the second paved corridor and near the Cave of Valli, we can see the Sandana Malai bulging out as a small mound. Go here for Guru Peyarcchi (moving of Jupiter planet): At Tiruchendur, Lord Murugan appears as Gnāna Guru. In this sacred place, Guru Bhagawan narrated the history of the asuras to Lord Murugan, before the Lord vanquished them. Hence, this holy place is considered as the Holy Place of Guru. Médha Dakshinamurthi in the paved corridor is seen sitting on four different seats, namely Koormam (tortoise), the Eight Serpents (Ashta Nākankal), the Eight Elephants (Ashta Gajās) and the Médha Malai (Wisdom Hill). On His rear side is the stone banyan tree on which are perched the four Vedas in the form of parrots. As He graces with knowledge and wisdom, He is called as Gnānaskanda Murthi. Generally, Dakshinamurti is seen with fire and utukkai (small drum tapering in the middle) in the hands; here He appears with mān and mallu (antelope and axe-like weapon). Worshipping Tiruchendur Murugan on the Guru Peyarcchi day will ward off the ill effects caused by the planet Jupiter. Lord Murugan who came here to extinguish Sūrapadman appears as Lord Subrahmanya with four arms. A notable aspect is that He appears in an ascetic posture holding flowers in His right hand performing Siva pooja. His tapasya should not be disturbed; so, there is no paved corridor for Him. His primary Utsava Murthi, Shanmukhar, is in a separate sanctum facing south. There is a corridor to go around and worship Him. The same pooja and other protocol offered to the primary deity is given to Him also. Procession with new Deepavali Dress: We all happily celebrate Deepāvali -- the day when Lord Vishnu annihilated Narakāsura -- by wearing new dresses. In the Tiruchendur temple also all deities are adorned with new dresses on the Deepāvali day. At dawn, all the retinue gods of this temple are smeared with sandal paste. Then the new dresses are carried in the silver palanquin in a procession and the deities are decked with them. It is believed that since this place where Lord Murugan wedded Teyvānai, Lord Indra gifts new dresses to his son-in-law and His retinue for Deepavali. 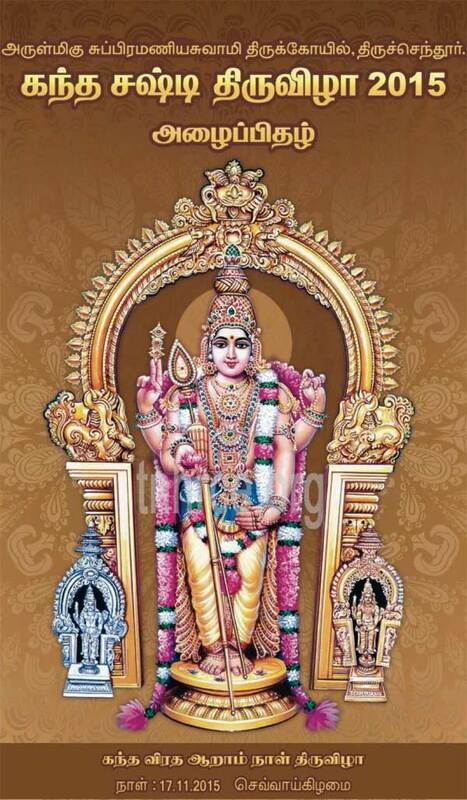 Lord Murugan performed a thanksgiving Siva Pooja after he won Sūrapadman. He, in this same form appears with a lotus flower on his right hand. Like a Siva devotee, He wears a matted hair on His head. On His left rear-side wall, there is a lingam. The Deepa Ārādhanai (worship with light) is first given to the Lingam and then only to Murugan. In the sanctum of Shanmukhar also there is a Lingam behind the deity. Both these Lingams are in darkness and could be seen only in the Deepa Ārādhanai light. Besides, adjacent to the sanctum of Murugan on the right side is the sanctum of Pancha Lingam. The tradition is that the devas come to worship them during the month of Mārkali. Opposite to the prime sanctum of Murugan are found Nandi, the carrier of Lord Siva and the divine Peacocks. Everyday, after the noon pooja, the priests carry milk and rice in a vessel, in a procession with the usual musical fanfare and immerse it in the sea. This is known as Ganga Pooja. In the Saravana Poigai here, a sculpture is presented with Lord Murugan as six kids crawling on six lotus flowers with the Krittika maidens at the center. The Devas made a complaint to Lord Siva to put an end to Sūrapadman who was oppressing them. Accepting their plea, Lord Siva from His third eye created six fire-sparks. Lord Murugan was born from that. Later, obeying Lord Sivas order, He came here to remove Sūrapadman. At this time, Guru Bhagawan, the Preceptor of the Devas, was in tapasya in this place praying for the darshan of Lord Murugan, Who appeared before him and stayed here. Through Guru Bhagawan He also learnt the history of the asuras. He sent as messenger His commander-in-chief, Veerabāhu to Sūrapadman, but he refused to listen to Lord Murugan’s words. Later the Lord went with His battalion and killed him. Guru Bhagawan requested the Lord to remain in this place where he had the Lord’s darshan. At the behest of Guru, the Lord continued to be here. Guru Bhagawan soon after called Viswakarma the divine Architect to erect the temple. Lord Murugan was called Jayanti Nāthar since he routed Sūrapadman. After a while, this name became Senthil Nāthar. The place was also called Tirujayantipuram (jayanti or victory) and in due course became Tiruchendur.